The Motorola MOTOTRBO XPR 7550 I.S. 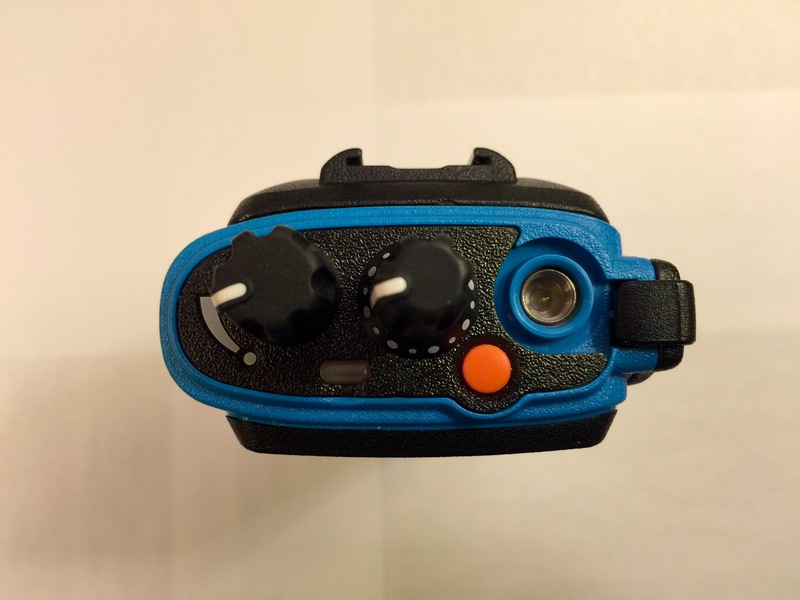 intrinsically safe DMR portable radio. The Motorola MOTOTRBO XPR 7550 I.S. is the Intrinsically Safe version of the popular Motorola MOTOTRBO XPR 7550 DMR portable radio that is only available in the Canadian market. This unit features best in class audio, integrated GPS, a multicolour LCD display, plus much more. This is an excellent single band radio for ham radio use on either the 2m or 70cm bands, as it is feature rich, durable and likely to more than satisfy even the most demanding user. At the time of this review, the “ham friendly” pricing for a new XPR 7550 I.S. from a Canadian Motorola dealer was $1,600 CAD. 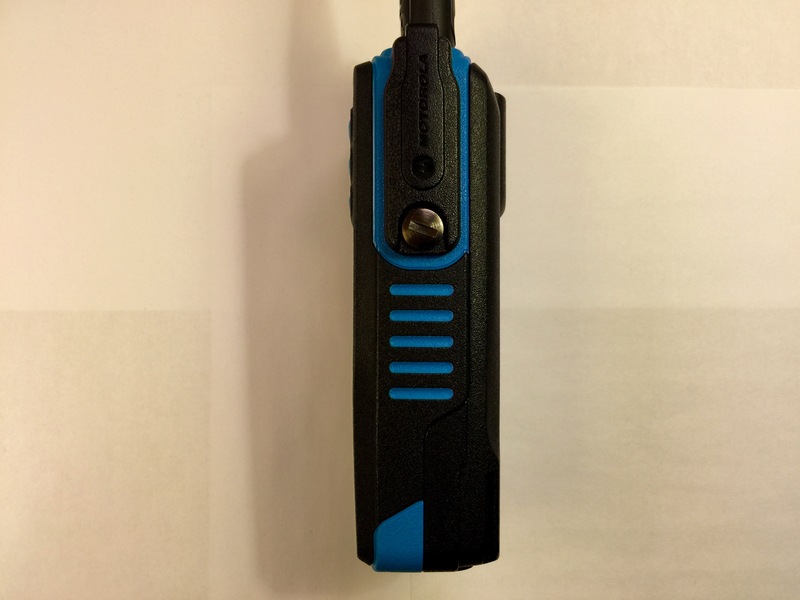 Antenna Connector: The antenna connector for this radio uses a SMA connection, allowing it to easily be connected to an external antenna. 25 kHz FM Operation: To be able to use this radio with the standard 25 kHz channel width found on the ham radio bands, you will need a free Entitlement ID from Motorola, which requires a valid Motorola MOTOTRBO CPS subscription. Since the XPR 7550 I.S. and the XPR 7550 are very much same radio, this review will only focus on the differences between these two radios. 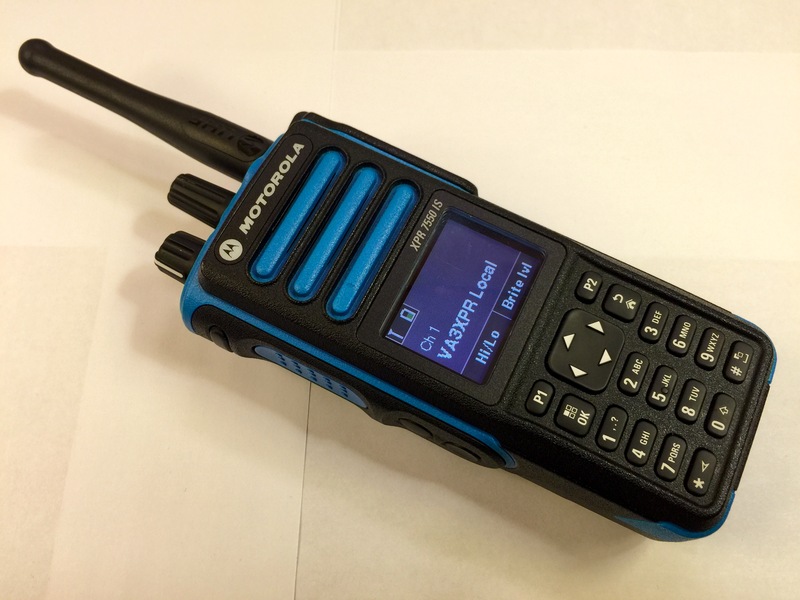 Check out the review of the Motorola MOTOTRBO XPR 7550 for the full details. One of the most obvious difference between the XPR 7550 I.S. and the XPR 7550 is blue housing, which appears to the standard colour for intrinsically safe products. For some readers, the blue colour will add to the appeal of the radio, rather than just the standard black, as is the case for the XPR 7550. 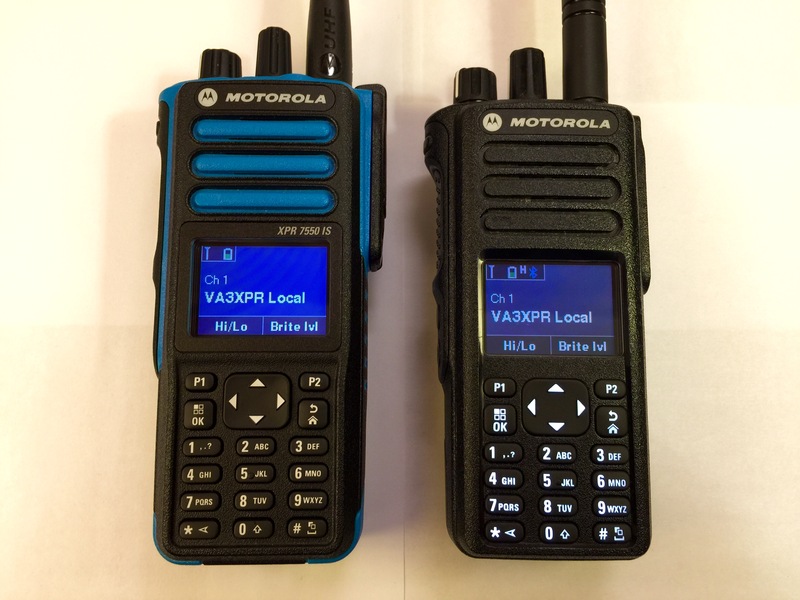 From the left, the Motorola MOTOTRBO XPR 7550 I.S. and the XPR 7550. Another notable difference between the XPR 7550 I.S. and the XPR 7550 is that the case is slightly larger – about 9.4 mm (0.37 in) taller. In addition, the XPR 7550 I.S. is about 127 g (4.5 oz), or about 36% heavier than the XPR 7550, making it noticeably heavier to carry. All of the buttons on the XPR 7550 I.S. are slightly larger on the XPR 7550, which makes them a bit easier to use when wearing gloves. For the two lower side buttons, one is slightly raised and the other is slightly depressed, allowing the user to easily distinguish between them, whereas on the XPR 7550, the lower button has a slightly raised centre nub. One other noticeable difference with the XPR 7550 I.S. is that the power switch/volume knob has a higher turning resistance than the XPR 7550. The left side of the Motorola MOTOTRBO XPR 7550 I.S., showing from the top, the monitor button, the PTT (push to talk) button and the two user programmable buttons at the bottom. 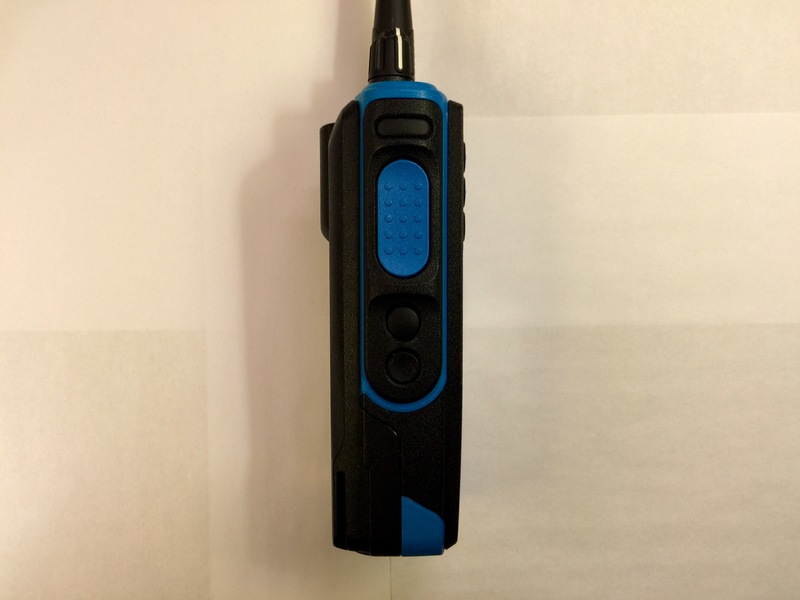 The right side of the Motorola MOTOTRBO XPR 7550 I.S., showing the accessory connector area. Of the features that differ between the XPR 7550 I.S. and the XPR 7550, the one that hams will appreciate the most is that the XPR 7550 I.S. employs a male SMA antenna connector. This allows the radio to easily be connected to an external antenna without the need for costly adapters or modifications. The top view of the Motorola MOTOTRBO XPR 7550 I.S., showing the on/off and volume knob, channel change knob, top button, antenna connector and status LED. One feature that makes the XPR 7550 a great radio is that it comes standard with integrated Bluetooth capabilities, allowing the radio to be paired with Bluetooth audio accessories and programmed without the need for a programming cable. Sadly, the XPR 7550 I.S. is not Bluetooth capable, so it’s wired only accessories and programming for this radio. Unlike other intrinsically safe radios, the XPR 7550 I.S. has a high power output of 4W on UHF and 5W on VHF. Having full power capability will ensure that the radio will be able to perform as one would expect from traditional UHF or VHF portables. If you found this review useful, please share it with your friends using the share buttons below!